Relax after work and explore your creative side with the fun gang from Common Street Arts! This week, join us to paint your own stylish pottery and create fabulous (and functional!) mosaics. Such the blast. 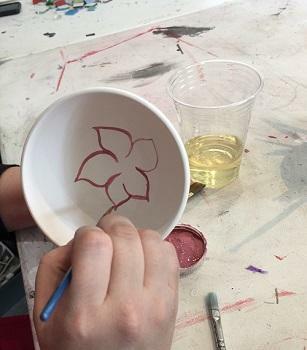 Participants will create one paint your own mug or bowl while learning the art of mosaic design - like adult coloring, these are creative activities to explore your hidden talents and unwind in fine company. Participants are welcome to bring a small object to add mosaic tile to: a vase, a plant pot, or a picture frame. Delicious snacks and beverages included. Please register in advance, space is limited!